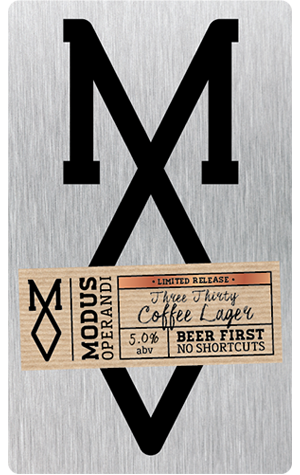 Before Modus Operandi properly burst onto the beer scene towards the end of 2014, they’d been tinkering away for a few months in their Mona Vale brewery and honing their core range of beers. But filling the final, vacant tap space was a one-off release called 3:30, so named for the time (in the post meridian sense) that you might be dwelling on whether it was too late for a coffee or too early for a beer. It’s a “pivotal” point in the day, say the brewers, so the answer, clearly, was both: a black coffee lager. 3:30 was, as it is again for its 2015 release, fermented with freshly roasted coffee beans from the well regarded Coffee Brothers who, rather conveniently, are situated right behind the Modus Operandi brewery (just as it takes a lot of beer to make wine, it takes a lot of coffee to brew beer – baristas presumably drink tea…). An impenetrably black brew, it delivers what it promises in regards to being both beer and coffee, though understandably the power of the black stuff will come to the fore over the lighter lager base. For its part, the lager – not your typical Modus Operandi style of beer, it should be said – has had the necessary lengthy, cool conditioning period in order to chase a crisp finish and remind you that you’re not staring down into an espresso. Coffee is a frequent addition to beer but not so much in lagers, particularly local ones – the most notable exception being Burleigh’s reliably lovely Black Giraffe – but 3:30 strikes the balance well and is, to borrow some of the coffee parlance, a fine blend.